Posted on December 8, 2016 | 4478 views | Topic : Events, Featured, Featured Dev, News & Articles, Property News. PETALING JAYA: Sunway Malls held the soft opening of its latest retail hub, Sunway Velocity Mall in the heart of Kuala Lumpur’s bustling neighbourhood of Cheras earlier today amid great Christmas cheer. Undoubtedly their best yet, Sunway Velocity Malls bring a unique shopping experience for 1.72 million residents of Cheras and its surrounding neighbourhoods including Ampang and Kuala Lumpur. Drawing on their immense experience, Sunway Malls has successfully integrated shopping, entertainment and gastronomy with the perfect social backdrop nestled in the heart of the larger 23-acre integrated Sunway Velocity development. 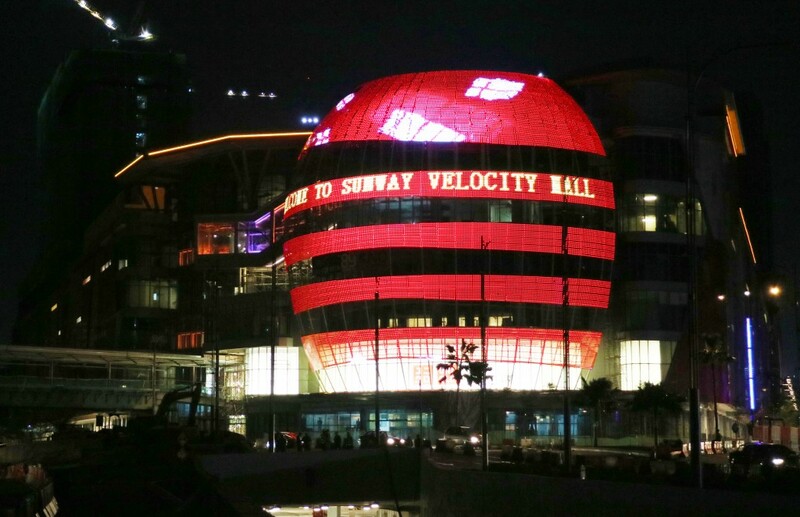 Sunway Velocity Mall was designed to exemplify the tagline “Elevate Every Moment” that is showcased through its impressive neo-futuristic façade, especially its unmissable feature the ‘KL Orb’, which presents the ideal backdrop for Instagrammers eager to snap wefies and selfies. More so in the evenings, when the colourful LED lights shine and create a space-like, sci-fi environment. In keeping with the upcoming holiday season, the CEO of Sunway Shopping Malls & Theme Parks, by H.C. Chan launched the mall’s Christmas campaign “Santa City”. The Christmas soft launch kick started with the launch of the much-anticipated Spend & Win Campaign by CEO of Sunway Shopping Malls & Theme Parks, Mr. H.C. Chan, COO of Sunway Malls Mr. Kevin Tan as well as the Managing Director of Volvo Car Malaysia Sdn Bhd, Mr. Lennart Stegland. The Spend and Win Campaign will run throughout Christmas and Chinese New Year from December 8, 2016 to February 12, 2017. The prizes up for grabs include a Volvo V40 grand prize, a fully paid trip for two to Korea by Always 21, Gintell De’Wise Butterfly Care massage chair, a Celistar Diamond Ring by SK Jewellery, a HERO bed frame & Nature’s Finest Himalaya mattress from Harvey Norman, and other amazing rewards. The launch was held at the Main Atrium that transformed into an urban Christmas Wonderland for the young and young-at-heart. The entire place was decorated to transport shoppers into Santa’s City where the main centerpiece, a 30ft Christmas tree, was surrounded by oversized presents and decorated with ornaments that enchanted the crowd. Embodying the spirit of giving during Christmas, about 30 children from Yayasan Sunbeams Home Ampang were present to enjoy the exciting festive atmosphere. The management and tenants of Sunway Velocity Mall also came together to present the home and the kids with a big surprise gift at the event as well. Shoppers also took a moment to pose and snap a picture with everyone’s favourite Christmas character, Santa and some won surprise gifts! There was plenty of Christmas cheer, carollers singing contemporary and beloved Christmas songs and dancing that kept everyone entertained. For kids, Sunway Velocity Mall will also run special Christmas workshops that are must-do. Happening every weekend and over the Christmas holidays, there will be two different sessions a day so children will definitely be entertained, learn and socialize. The best part is that kids can take part for every single workshop throughout the campaign for free. During the event, a prize was also presented to the winner of the “V Travel Facebook Contest” that was held in conjunction with the soft opening of the mall. The winner Sueann Yew will enjoy a fully paid vacation for two to Victoria, Australia sponsored by Sunway Travel and Visit Melbourne. This is the first destination (out of four) in the V Vacation series that will be conducted throughout 2017. The mall has also decided to provide an extra treat for the soft opening campaign called the “Everything 8 for 8 Days” promotion where too-good-to-be-true deals are set at astonishing prices of RM0.80, RM 8, RM 80 and more. Campaign runs until December 15, 2016. In his speech, Chan said Sunway’s aim was to provide a home away from home for urbanites to relax, unwind and enjoy a great time with friends and family. “SVM was built and designed with one key purpose, to enrich the life experiences of its surrounding community. This will become the hip, select place that provides the best retail and entertainment experience,” he said. Shopping will never be the same thanks to its perfectly designed layout that allows shoppers to move through four different precincts, Vanity Hall, Marketplace, Food Street Food and Commune @ Sunway Velocity. The seven level mall, with 1 milion sqft of retail space, will house big retail names including the first AEON MaxValu Prime in the country and the third after Japan and Hong Kong. The other two main anchors are Parkson and TGV Cinemas, the leading cinema exhibitor in Malaysia which also houses IMAX, the world’s most immersive movie experience and the largest IMAX screen in Malaysia. There are also other key tenants to satisfy even the most demanding shopper including Grand Imperial, Uniqlo, Harvey Norman, Padini Concept Store, Popular Bookstore, Home’s Harmony, Toys ‘R’ Us, JD Sports and CHi-X Fitness. Chan also said that the mall is part of the golden triangle of retail spaces comprising recently launched IKEA Cheras, AEON Maluri Shopping Centre, MyTOWN Shopping Centre, and the Tun Razak Exchange (TRX) Lifestyle Quarter development. “We see the whole location as a ‘Sunway-TRX-IKEA (STI) Retail Triangle’ where each retail element complements each other, thanks to their unique individual offerings. This conurbation then has the opportunity to attract a significantly larger audience,” he added. Apart from that, Sunway Velocity Mall is easily accessible through major artery roads including Jalan Cheras, Jalan Loke Yew, Jalan Pudu and Jalan Tun Razak as well as the Smart highway, KL-Seremban highway, New Pantai Expressway (NPE) and Maju Expressway. The mall will also be served by the Maluri LRT interchange station and the upcoming Cochrane and Maluri LRT stations.